Who “holds” the working papers of the Climategate inquiry? 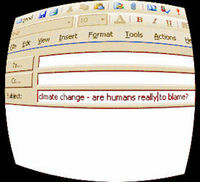 In 2009 someone hacked into e-mails belonging to the Climate Research Unit at UEA and leaked them widely. Climate change sceptics whooped with delight because they thought that the e-mails showed attempts to suppress or gerrymander climate data (see e.g. this example from James Delingpole with some of the ticklish e-mails, and for more background, less tendentiously put, my post on an earlier UEA case). And the CRU data was important; it had made its way into the highly influential IPCC reports. UEA understandably thought that something needed doing in response to the leaks, and commissioned an inquiry, the Independent Climate Change E-mail Review. ICCER reported in 2010: see here for the report and here for a short summary. ICCER concluded that there had not been any systematic manipulation of data, though there had been a lack of openness by CRU in dealing with requests for information. This recent decision concerns a campaigner’s efforts to get copies of the working papers of the Review. The First Tier Tribunal (as the Information Commissioner before it) refused to order UEA to produce them. UEA did not “hold” them, ICCER did. And ICCER was not a public authority capable of being ordered to produce them. This is not the first time, by any means, that the UEA came across the Environment Information Regulations (EIR) – derived from the Aarhus Convention and the EU Directive on public access to environmental information. When the leaks occurred, a lot of requests for further information were put in (105 in 2009 alone) and some of the criticism of UEA in ICCER’s report was about how the UEA responded to these requests. More recently, the Information Commissioner published a ruling telling CRU to release some weather data it had put together from all over the world. This time, the issue was simple to state, though not so simple to answer. UEA commissioned the Review. The Review held information. But did UEA “hold’ that information? The question is set by reg.3(2) of the EIR: information was held by a public authority if it is in the authority’s possession and has been produced or received by the authority, or is held by another person on behalf of the authority. It matters, of course, because if ICCER held it on its (ICCER’s) own behalf, UEA could not be ordered to release it up to third party requests. There is a certain amount of learning on this test, helpfully set out at - of the ruling. The test is not whether the public authority controls or possesses or owns the information in question, simply whether it “holds” it – an ordinary English word. the ICCER was a sham, and that it was always under the control of the UEA, and that it was set up to exculpate its scientists of any criminal offences and protect its reputation. He pointed to one of the Review team being an ex-UEA academic (there for 18 years), and the way in which the appellant’s submission had been redacted (to avoid defamatory material, said ICCER). So, the appellant argued, the ICCER held them for UEA, and the documents could be obtained from UEA. The Information Commissioner and UEA rejected this. The whole purpose of the inquiry was an independent review of the e-mail saga and it was set up so that its chair (Sir Muir Russell, ex civil servant and Glasgow University Vice-Chancellor) could decide exactly how to run it. He chose the team, and then went about directing the Review. This account was accepted by the FTT. They heard evidence from Sir Muir and Professor Edward Acton, the Vice-Chancellor of UEA, and it is evident that they were cross-examined hard on the sham/whitewash theory. The FTT did think it surprising that there was no written contract between UEA and Sir Muir, which might have been expected to explain the basis upon which the documentation was held after completion of the review – this was despite Sir Muir having his own lawyers in place. Equally, the FTT thought it may have been unwise to appoint the ex-UEA academic as part of the reviewing team. But there was ultimately no evidence that the ICCER was effectively controlled by UEA, and hence ICCER (in effect Sir Muir) held the documents, and UEA did not. a public authority can simply outsource any embarrassing environmental matters to casual employees and private companies who might do the authorities’ bidding and then destroy any inconvenient information that the authority wishes to ignore. Well, no, it cannot, or it can only do so without being subject to the EIRs where the inquiry is truly independent of the public authority. And if the inquiry is not truly independent of the public authority, it will not have the credibility which it needs. It may be that the information should be held by the UEA and there may be good reason why, barring anything provided in confidence, the information should be passed to the UEA to form part of its historical records. Were that to happen, then in the future, the information may be held by the UEA. The irony was not lost on them that the UEA witness was a historian by specialism who would ordinarily have been deeply interested in how documents would be kept and dealt with after completion of the review. In spite of the fact that they just did. Willful obtuseness is not a virtue. First, Muir refused to ever entertain the questions that forced the inquiry in the first place, then he puts the records in his back pocket and walks away? If you believe this was an independent inquiry, you probably believe that the Soviet Union was a worker’s paradise. As UEA does not “hold” the material, nor has it requested copies of the material, it could be that the material is considered the property of Sir Muir insofar as it is material that he used in the course of his review as data but which is not a property of the review report. As such it would not have to be kept, i.e. Sir Muir could shred it and delete it. Perhaps this has been done already or would be should public access become a possibility. The outsourcing and “holding” of material (interviews, pertinent documentation etc.) to avoid FOI disclosure is just one of the ways our “democratic, law-bound” governors continue practices that, as Tony Blair said, allow “good” government. If the world is so full of duplicity, corruption and criminality of mind as to require this, it explains all about the human condition. If it is not the world but the world of leadership elite, it tells us what the future of the human species will be like: the same as today, except with laser weaponry. The inner cabal of anti-humans are exposed and what happens – cover-up dear, you’re showing our true colors. Nice Irony, in view of climategate emails such as “I think I’ll delete the file rather than send to anyone”. …It is a little odd that a public authority can commission an inquiry of this sort, pay for it, and use its results, in this case, broadly to clear its name, and then not be able to produce documents which, had the inquiry been internal, it would have been required to produce to the requester…. On the surface of it would appear that CRU purposely failed to keep detailed copies of anything to do with the report in their records precisely so they could head off challenges like that raised by Mr Holland. To me it would by inexcusable for any organisation NOT to keep detailed records in their possession for an inquiry like that which essentially cleared them of all wrong doing. The fact that it appears no records were kept by CRU and that the records held by ICCER are exempt from public review one can only come to the conclusion that this is exactly what CRU wanted to happen. The circumstances of this case make uncomfortable reading. It now appears that so long as a public authority can demonstrate that, in commissioning and funding an independent external enquiry – which can be aptly described as an ad hoc group – it has surrendered all information previously in its possession and control to that enquiry, then regulation 3(2)(b) of the Environmental Information Regulations 2004 does not apply. I am not quite sure that, in this instance, a parallel should be drawn between the independence that the Office of the Information Commissioner enjoys from the Ministry of Justice that funds it and the independence that ICCER enjoyed from the UEA. For a start, the Information Commissioner’s Office reports directly to Parliament. The least unfabourable thing to be said about this judgement is that the Court was not obliged to behave with such deference to the Respondent..Justice is not seen to be served when a court allows a public body to cover up misdeeds by such a flimsy pretext as presented in this case. However, in the UK no party to a case can challenge legislation or a regulation on the basis that it denies a constitutional right. The only recourse would be to the Human Rights Act: But how would a person achieve standing in such a complaint under the HR Act? The Act appears not to apply where a public body covers up its misdeeds in a matter that is a public rather than purely private concern. The ulimate responsibility for abuse of the public trust by a public body lies with Parliament. As defender of the publuc’s right to good governance Parliament risks being seen as lacking legitimacy. Worse, Parliament may be seen as the shield of bureaucrats who serve themselves but neither the state nor the people. In the UK Parliament is supreme. [Unless Parliament has ceeded power to the EU.] In my opinion, the unwritten constitution of the UK is at best only a hope and a prayer.. At worst, the unwritten constitution is just smoke and mirrors, a myth for infants’ schools, a load of old cobblers. There are no constraints on the laws or regulations that Parliament can enact. We should expect more or less what we have got: a government and its bureaucracy that continues to prescribe behavious for aspects of personal and family life formerly considered outside the scope of government control and intervention. Are there no bounds beyond which government shall not go? Is there no limit to government power? When all power is in the hands of the government and its bureaucrats, will we be consoled by the perfections of the “totalitarian democracy” that we will have achieved? What UKIP should consider is a Charter of Rights that would define human rights, including the rights of citizens to good governance. A court could then base a decicision on interpreting the laws and regulations or alternatively consider whether or not the law itself failed to comply with the Bill of Rights.. The present Human Rights Act does not do the job because it has limited scope and has no real force. What is needed is a Charter or Rights that would enable a court to strike down a law, a Charter that is entrenced deeply enough to prevent Parliament from changing the Charter itself by a simple majority of its members. In 1982 the UK Parliament amended the [mostly written] Constitution of Canada by adding a Charter of Rights. Why not a Charter of Rights for the UK? “Well no it cannot”. Could you please elaborate? As the iccer has been since disbanded, who holds anything at the moment? Germany has come to their senses and is kicking out the AGW scoundrels who ran their energy policies as alternative energy in Germany goes belly up. Higher Energy Costs = More Poor = More Children Dying. Cheap and abundant fossil fuel resources should not be denied to the people by a few elite people in the Green movement with Dystopian dreams for a fossil free world. A Dystopian world that would plunge the people of the world into poverty and economic ruin. Climate Change is not the problem. In the real world the high cost of green energy policies are killing people. http://www.telegraph.co.uk/health/elderhealth/9959856/Its-the-cold-not-g… Power to the people not the anti humanistic elites in the green movement.